No Credit Check: By NOT running a credit report, your credit score stays intact. Free Delivery & Set up: Within thirty (30) miles of dealer’s location. Check Out our FREE Building Buyer’s Guide Download NOW! At Spring Hill Sheds, we are happy to able to provide the opportunity for any one to own a portable buiding. Our rent to own sheds are one of the things that sets Spring Hill Sheds apart from other portable building companies. For our customers with the money needed to buy a portable shed outright, buying is a simple transaction. Simply pick the portable building you would like and pay with cash, check, or credit card. For our customers who either don’t want to pay cash or can’t afford to pay the whole amount up front for a backyard barn, we offer our easy Rent-To-Own Shed plan. In addition to our low monthly payments, one major advantage of our rent-to-own shed program is that it does not affect your credit rating at all. With NO Credit Checks, all you have to do is pay the first month’s rent, and we’ll deliver a building to your location (if within 30 miles of our lot in Spring Hill, TN.) From then on, you pay monthly rent for 36 months and the building is yours! In addition, you can pay the building off at any time with no pre-prepayment penalty. You won’t find a cheaper or more attainable Rent-to-Own plan anywhere. The rent-to-own rental agreement is on a month to month basis, meaning you have the flexibility to turn in the building at anytime for any reason. (after the initial period of 1–4 months.) Call us for details. 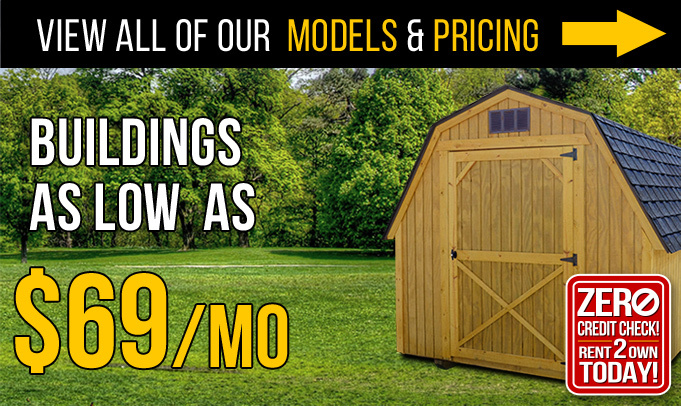 With either purchase option, you will see why Spring Hill Sheds is the best choice in owning a portable building in or around Spring Hill, TN. With several models available and multiple finishes on each model, the possibilities are endless. Since we have made owning a backyard barn easier than ever, the only thing you have to do now is pick out your barn! !